U.S.-based semiconductor giant Intel has agreed with Samsung Electronics to provide advanced processor chips for the upcoming budget Samsung tablets, according to sources from Samsung and Intel, Thursday. Under the agreement, Samsung Electronics will use Intel's Atom-branded processors in its Galaxy Tab3 tablets. The latest move is expected to pave the way for Intel to expand its presence in the rising mobile device market. The Tab3 is expected to be unveiled at the 2013 Computex conference during the first week of June in Taiwan. "This is a win-win deal for both sides. Intel, which is trying to cut its heavy reliance on PC business, offered better pricing for Samsung that is shifting its focus toward tablets following its huge success in smartphones," a Samsung research staff at one of its local factories Thursday. "Samsung wants to secure as many processors as possible at better pricing. That's why Samsung Electronics has recently been diversifying its procurement channel in processor chips as a strategy to stabilize production yields of its in-house Exynos-branded processors," he added. Samsung's co-CEO Shin Jong-kyun recently told reporters that it plans to grow its tablet business two-fold by 2013 by selling some 33 million Galaxy Tabs. He then vowed to expand its leadership in the smartphone to tablet sector. Processor chips are powering an entire computing system and chip makers are migrating to the profitable chips amid the increase of data-intensive devices. Intel is considered a late comer in the market. In an apparent strategy to further expand its partnership with Samsung, Intel Korea is hiring more chip developers, according to industry officials. "The number of Intel's Atom-branded chip engineers increased to over 50 this year from last year's six in Korea. Most of them are working for Samsung-related projects with a mission to customize circuits for adaptation on Samsung products," said an Intel source, asking not to be named. An Intel spokeswoman in Korea said it doesn't publicize the number of chip engineers. Through its collaboration with Samsung Electronics, Intel is trying to expand its presence in the mobile technology industry and to offset falling sales in conventional chips. Intel has been improving the performance and energy efficiency of its "Atom" and "Core" processors and embracing Google Android, with the hope that it will convince more device makers to use its chips in their products. 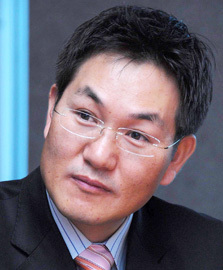 Lee Hee-sung, country manager at Intel Korea, is ready to back the headquarters' drive for mobile processors as he hinted at launching a full-scale promotional campaign to push leading consumer electronics firms including LG Electronics to buy its Atom processors. "Intel is strongly requesting Samsung and LG Electronics to use our processors for their smart devices and I can say the chances are very high," said Lee in a recent meeting with reporters at its office in Yeouido, Seoul. "The smartphone market will expand in a steady manner. Intel has more chances to grow our processor business as manufacturers are reviewing the possibility of using different chips from different sourcing channels in order to lower risks in sourcing," said Lee.